Every day we are lied to by mainstream media and Hollywood. This is especially apparent in the portrayal of toasters. Toasters in films and cartoons consistently launch hot grilled bread several feet into the air. However, real toasters like the one in your kitchen merely lift the bread by an inch or so after it's grilled. This is very disappointing, and with smaller grilled products, leaves you digging inside an electrical appliance with a spatula to remove your breakfast. So, one morning I assembled a team to save the world. Omar, Phil and me descended on Winchester to find parts for our prototype. A brief warning: Do not do this. It involves inserting foreign bits of metal into mains appliances. These are not instructions. The first job was to remove the original spring, although I kept it in case we wanted to use it in addition to the extra springs. I then clipped the new springs so the end formed a hook shape rather than a ring, and attached it in place of the original one. This gave quite a good improvement in the spring force, but it could be better. 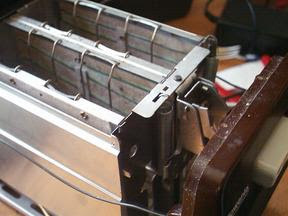 Happily, it was quite easy to attach the second spring between two other points on the chassis. 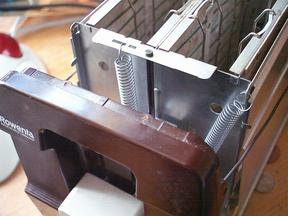 The spring still releases without excessive force - this is important, because the toaster could stay on forever if the spring force gets so high it can't release itself. So, we reassembled the toaster and tried it out without power applied. The first two test items - half a bagel and a slice of stale bread - got a reasonable distance out of the toaster, not quite as high as hoped but as good as we could do, at least until we got new springs. After this, we decided we needed to use an RCD before plugging it in. We didn't have one, so we left it and went to drink beer. Four months later, I found the toaster in a box I'd used to move house, so went to buy an RCD and try it out. This time, the results were very pleasing. The picture above was the first take with my camera and the only one needed. Two slices of wholemeal bread on minimum toast setting made it at least three loaf-heights out of the toaster, almost hitting the base of the cupboard. Naturally, it landed nowhere near the toaster, but luckily not on the floor. The toast was tasty.